I will never forget the first time my Dad took me fly fishing. As far back as I can remember, fishing has been a major part of my life. It’s an experience my Dad and I still share together today. But that day was significant to me; more than most fishing trips. I was ten years old. As a very young boy I was always fascinated with watching my Dad cast his fly rod to a rising trout. He held off on teaching me to cast a fly rod until that summer to ensure that I was not only physically able to cast the rod but that I also had some semblance of patience. After weeks of “10 o’clock to 2 o’clock” and “you’re going too far forward/back”, it was finally time to chase trout on the river with a fly! The time I spent in western Montana as a child is filled with fond memories. The valley and the mountains that surrounded our quaint little town was a seemingly endless playground for my two brothers and me. I was spoiled by sunsets, scenery, mountains, and countless other things. The first day I went fly fishing embodied all these things. It was a warm evening in August and Dad pointed out the bugshovering over the stream in thick clouds. Grasshoppers leaped from all sides as we wandered towards the bank. From what I recall, almost every cast result in an eat from an eager trout. The rod pulsed in my hands as the fish shook their heads, and my smile grew larger by the minute. From that day on, I knew I loved fly fishing. I sat in bed that night filled with joy after a successful outing on the water. It felt different than my normal fishing excursions and I knew fly fishing was special. Fourteen years later, memories of that day stick with me as if it happened yesterday. As I got older, I reminisced. “Was it really that incredible? Did we really catch that many fish? Did it just seem that great because I was young and easily impressed?” My family moved away from Montana the following fall, removing me from the proximity to the stream my Dad took me to that day. Since then, I’ve had the good fortune to fish some incredible waters. Yet, I would often find myself pondering over that day long ago and the stream that began my fly fishing obsession. Fast forward to the summer of 2018. I attended a Trout Unlimited event held near the western Montana town I lived in during that fateful tenth year of my childhood. In between workshops we were granted some fishing time, and I visited the exact spot on the stream my Dad took me to that day long ago. I didn’t have much time to spend there, but it was enough time to leave me wanting more. When the event came to an end, I made the long drive back to West Yellowstone. I knew I had to return to that stream as soon as possible. Labor Day weekend came a few weeks after. One last, extended weekend before college classes were back in full swing and hunting season would become more of a priority for me than fishing. I chose to return to that stream and attempt to relive that summer day when I was a child. My friends Connor and Tyler made the journey with me, and we planned to camp multiple nights in the area. We couldn’t have asked for better conditions. The warm weather and breeze made perfect conditions for fishing hoppers during the day, and the cool evenings were left for resting by the fire, roasting hot dogs, and enjoying good conversation at night. From the moment we arrived on Saturday to the moment we left on Monday the fishing was spectacular. Cut banks, rocks, and seams regularly held fish that were eager and willing to attack a dry fly. SLURP! SMACK! GULP! It wasn’t uncommon to see grasshoppers tumble through the wind and onto the water, twitch on the surface, and be eaten by a hungry cutthroat. Each evening the sunset glistened over the peaks and through the trees signaling the end of an incredible day. The more time we spent there, the more clearly, I remembered what it was like to be there as a ten-year-old, fly fishing for the first time. On our last day, we fished another lesser-known stream in the area that I had fond memories of fishing as a kid with conventional tackle. I recalled memories of good numbers of quality fish that I had caught there with my Dad in my youth. My childhood memories had served us well on this trip so far, so we decided to put our faith in them once again. The stream meanders through grassy fields of the valley. It was, and still is, a slow-moving stream with deep cut-banks and overhanging grass on both sides. We tossed our hopper patterns as tight to the bank as possible while moving upstream. Resident brown trout attacked our flies throughout the next few hours, but now, time was running short for our trip. I found myself hoping for one last memorable fish to complete this perfect weekend. Connor and Tyler had both netted browns in the ballpark of eighteen inches that morning and, perhaps a bit selfishly, I wanted one, too. In the final minutes before our departure, I changed flies one last time. I happened to glance up in time to see a fish dart from the cut-bank, gobble a drifting hopper, and return to its ambush spot. I couldn’t see exactly how big it was, but from the sound it made slapping the surface I could only assume this was a big one. I prepped my fly and lined up my cast. I laid my foam bug on the water about six feet above where I had seen the fish rise to ensure the drift looked as natural as possible. Before my fly could move two feet it was slammed by a different fish! 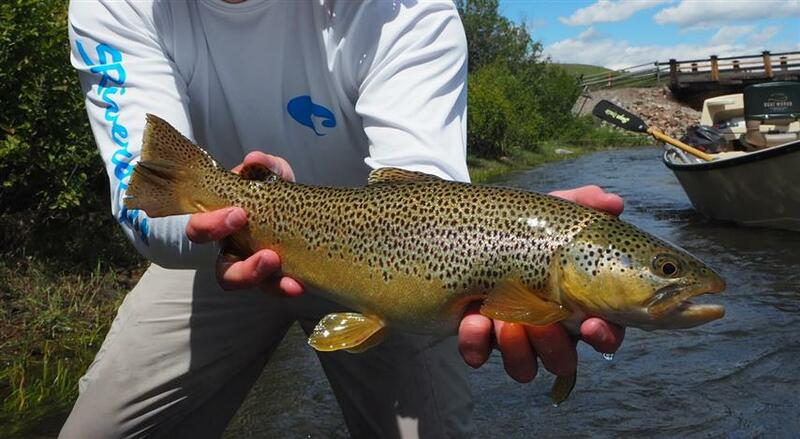 A feisty little brown was in my net, but this butter-colored beauty wasn’t the fish I was after. Once again, I lined up my cast. I placed the fly roughly four feet above the target location this time. I watched in anticipation, waiting for the predator I knew that was lurking in the shadows to expose itself. In an instant, a gold flash bolted from the bank and attacked my fly. Fish on! The fish bulldogged, pulled, and fought hard to stay under the cut bank it called home. Eventually it conceded the battle and found itself in the bottom of my net. After a quick photo and moment of admiration my opponent returned to its home. It was the perfect ending to a perfect fly fishing weekend. Today I look back on the streams of my childhood with even more nostalgia than I had previously. If I fished those waters regularly throughout the year, I would surely have slow days and fruitless trips. But, in my mind, they remain pristine. Places that represent all things good in a world that can sometimes be overwhelming. I believe that’s why we have memories that we romanticize and glorify. The idea that there was a time and a place where nothing could bring us down is comforting. Everyone should have a special place like that in their heart. For me, it will always be the first place my Dad took me fly fishing. Maybe one day I will doubt again how amazing it was. When that day comes, I will return there, and hopefully I’ll be reminded all over again that, in reality it’s better than I remembered. Early on, our day was mostly about fighting through the wind with our casts and with the driftboat, untangling our flies from the bushes when we tossed them too close to the bank, and listening to Mickey raise his voice in frustration each time he missed a fish. Wave-trains came and went, and we fished on. Every time we passed an overhanging bush someone would say, “There has to be a fish there.” We knew it was only a matter of time until that statement would ring true. Over the years I have discovered that there is a vast diversity among fly fishers, and their angling goals. Some anglers are out to catch as many fish as possible, some want to catch only big fish, and others are in it just for the sake of being outside. And, some anglers have more elaborate goals such as catching a specific species of fish, maybe on a specific body of water, or on a specific fly. Goals vary and change regularly, and it is not uncommon to change them multiple times within a trip. The more I am out on the water the more I find myself in pursuit of new (to me) goals. If my varied pursuits have taught me anything it’s that fly fishing is not always about catching high numbers of fish. Don’t get me wrong, I love days where it seems like I can’t keep the fish off of my flies even if I tried. But, fishing for numbers isn’t the only thing that makes this sport worthwhile. On this specific day, for example, I was pursuing one specific “eat” with one specific fly. Mickey was on the oars, Belen was up front, and I was pulling duty as the “tailgunner.” We were coming upon one of those infamous fly-hungry, overhanging bushes. Mickey slid the boat into position as we approached our target. “Get it in there! Get it in there”, Mickey repeated. Belen took the first shot and barely missed what we all thought was the feeding lane. It was my turn to take a swing. We were halfway past the shadow being cast by the bush. This was my window. I plopped my false Pteronarcys down on target and it floated into the shadows right off the bank. All of a sudden there was a wake and a fish’s body halfway out of the water coming at my fly. It hit the dry like a freight train and before I even had time to think I was locked in with a fat female brown trout. We all jumped and hollered with excitement as I fought the bulldogging fish. With that “one quality fish” on the big bug in my hands I found myself overwhelmed with satisfaction. We conducted a quick photo shoot as I held her in the water to regain strength after our brief encounter. I admired the sheer beauty of this fish. Her buttery-brown skin glistened in the sunlight and her belly spilled over my fingers, filled with salmonflies. She swam away as quickly as she ate my fly leaving me with wet hands and an incredible memory. After multiple high-fives and a few moments of reliving the event we pressed on downstream. We rose a few other fish that day, but nothing compared to the strike of that brown beauty. No other feeling in the world compares to the feeling of accomplishment. That feeling of being on top of the world and nothing on Heaven or Earth can tear you down. To me, that feeling is one of the main reasons why fly fishing is such an addictive sport. As anglers we find ourselves in relentless pursuit of fish, and often times that pursuit is riddled with failures and near successes. It’s these trials that make the successful days that much more satisfying, because we know how much work it took to find ourselves in those moments of triumph. On this particular summer day I found myself basking in triumph. From the moment we launched the boat that morning I knew what I wanted that day to be all about. That day was all about the eat.